First post of 2013....Happy New Year everyone! Summer has been here well & truly the last few days, what a cracking start to 2013. For me that means time to dust off the ice cream maker. Not much beats homemade ice cream in the Summer months, or any month for me, come to think of if, & once you have the basics down pat the possibilities are endless. Over in Melbourne the other week we were on a little road trip out in the country we saw a sign for a chocolaterie & did the only thing that any self respecting chocolate lovers would do & we took a little detour. A few minutes later & we arrived at the Yarra Valley Chocolaterie. Along with the most chocolate I have ever seen in one place they also had an ice creamery. The ice cream was rich & creamy with lashings of real flavours, chunks of chocolate, cherries, macadamias, caramel, swirled through it. It was all far too tempting to resist. I went with the rum & raisin. Oh so creamy & spiked with rum & plump sweet raisins it was quite heavenly ice cream. Not quite as heavenly as this fennel ice cream though which still stays top of the list. Thinking of fennel & ice cream got me to thinking about what other spices I could infuse into a batch. Cardamom is another favourite spice & it works wonderfully well with chocolate so it is not averse to playing nice with sweet. On the menu for a Sunday lunch was some of Jamie’s Chocolate Chestnut Fondant for which cardamom ice cream could well be the perfect companion & it really was. In a large saucepan, add the cream, milk and 1/2 a cup of the sugar. Bring it to the boil & remove from the heat. Add crushed cardamom pods & allow to infuse for 30 minutes. Sieve the mixture to remove the cardamom pods & seeds. Place the egg yolks, the remaining 1/2 cup of sugar & the vanilla essence in to the bowl of a food processor & whisk until pale & thick, about 10 minutes. Return the cream to the heat & bring to a boil over a medium heat. Once boiled reduce to a low heat. Remove a couple of cups of the hot cream mixture & slowly add them to the egg mixture. Mix & then slowly pour the egg mixture into saucepan of hot cream. Stir constantly until the mixture thickens, it will coat the back of a spoon once it is ready. Remove saucepan from heat & place the custard in a plastic container. Place in the fridge, for several hours or overnight until the custard is completely cooled. Once cooled churn in an ice cream maker according to the manufacturer’s instructions. Return ice cream to the freezer & remove 20 minutes or so before you want to serve it. Like the fennel ice cream it really does work, the fragrant cardamom infuses the cream & it’s eucalyptus & floral like flavours become wonderfully mellowed when enveloped in the rich ice cream. And the perfect companion a slice of Chocolate Chestnut Fondant. 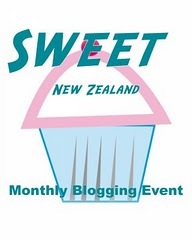 This is also my entry for Sweet New Zealand, this month being hosted by the lovely Arfi over at Home Mades. Happy New Year Mairi! Very decadent and a great combination of flavours. I love your ice cream flavours and will definitely make this before summer is out. Or perhaps before summer arrives given the howling gale outside. Happy 2013. Thanks Julie....hoping some sunshine has reached you! However, I reckon ice cream works pretty much any kind of weather! Ooooohhh that chocolate cake!! Haven't been eating chocolate cake for ages. I bet it taste really good with cardamom ice cream. A bliss summer, I am sure. This sound super yummy Mairi, what a great idea making isce cream with cardamom, I want to try!! +1! !